Clashes took place in the city of Suez in Egypt on December 13, 2013. Unrest is escalating against military rule., a photo by Pan-African News Wire File Photos on Flickr. Human Rights Watch (HRW) criticised Saturday the interim Egyptian government’s decision to label the Muslim Brotherhood as a terrorist organisation, arguing the decision is politically driven. "The Egyptian government’s designation of the Muslim Brotherhood as a terrorist organisation appears to be aimed at expanding the crackdown on peaceful Brotherhood activities and imposing harsh sanctions on its supporters," HRW stated, urging the government to reverse its decision. The statement further argued that the government blamed the Brotherhood for the Mansoura bombing Tuesday without any evidence or a proper investigation. The government's decision came after a bomb attack targeted the Security Directorate of Mansoura in the Nile Delta, 24 December. The Brotherhood condemned the blast while a Sinai-based militant group, Ansar Bayt Al-Maqdis, claimed responsibility for the attack. The rights watchdog expressed the belief that the government’s decision to deem the Muslim Brotherhood a terrorist organisation came solely to end all Brotherhood activities as part of a clampdown on the group. 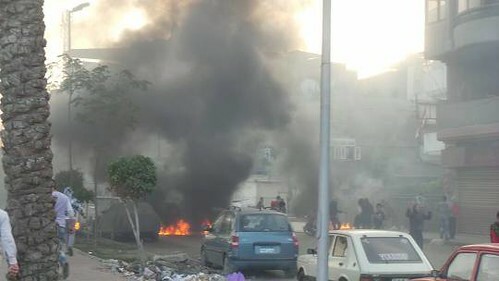 Eissa said the deadly bombing in Mansoura, as well as recent attacks on churches and other violent incidents attributed to members of the group, led to the decision. According to an interior ministry statement, those who participate in Brotherhood demonstrations could face up to five years in prison while those who lead them may face the death penalty. The government had also stated that promoting and funding the Brotherhood will be subject to criminal sanction. Since Wednesday, the “Egyptian authorities intensified their crackdown against the Brotherhood,” HRW stated. The rights group also condemned the freezing of funds believed to be linked to the Brotherhood. "On 23 December, Al-Ahram reported that the Central Bank had frozen the bank accounts of over 1,000 non-governmental organisations reportedly linked to the Muslim Brotherhood. This announcement so drastically affects health services in Egypt, much of which are Brotherhood-linked charities," HRW said. "The government’s assault on the Brotherhood has gone beyond clamping down on peaceful political activities to curtailing desperately needed health services and schools for ordinary Egyptians," Sarah Leah Whitson, Middle East and North Africa director at HRW, said. "There seems to be no end to this wave of oppression." "Egyptians can and should debate the sincerity and extent of the Muslim Brotherhood’s commitment to democracy, but the unrelenting repression of the group flouts fundamental human rights and freedoms," Whitson said. A government crackdown on the Muslim Brotherhood following the dispersal of two pro-Morsi sit-ins in August landed hundreds of Brotherhood members in jail on charges of inciting violence. Since August, the country has witnessed an increasing number of militant attacks on policemen and military personnel. The Muslim Brotherhood has repeatedly denied any links to militant attacks against the government.